A Bengali couple lost two sons straight after they were born. They named their third, surviving son, Dukhi. Dukhi was spontaneously attracted to Lord Caitanya and Lord Nityananda. Whenever he would hear anything about the Lord or His associates, he would run to that place with great enthusiasm. When he grew up a little, his father and mother told that it was time for him to accept a spiritual master. The child told them that he wanted to accept Hridaya Chaitanya of Ambika Kalna, a disciple of Gauridas Pandit as his spiritual master. So he was sent there and Hridayachaitanya accepted him as his disciple. He gave him the name Dukhi Krishna das and sent him to be trained under Srila Jiva Goswami. Dukhi Krishna Das, Narottam Das Thakur & Srinivas Acharya became most intimate loving friends. Narottam Das Thakur was the disciple of Loknath Goswami and Srinivas Acharya was the disciple of Gopal Bhatta Goswami. But because they were all serving their guru and were all united in the service of the six Goswamis and the Lord, there were no boundaries to the intimacies of their affection and respect for each other. This is a Vaisnava society. Jiva Goswami gave Dukhi Krishna Das the service to sweep and clean the pathways of seva kunj. He would get on his hands and knees and sweep the pathways with a broom. He would be completely covered with dust but he felt very grateful and honored to do this menial service. When Krishna sees that we are grateful for the service we have and that we do not take any aspect of the devotional service to be ordinary or for granted, then Krishna really accepts our devotion and that gives pleasure to Him. Happiness in Krishna Consciousness is when we can deeply be grateful for whatever service we are allowed to do. If we are grateful for any opportunity to serve, that gratitude is an expression of our love for Krishna and that is what makes us happy. If we are not grateful, even if we have every type of material and spiritual facility and everything is just going the way we want it to go, there could be no happiness in our heart because Krishna is not pleased with us. Our happiness is when Krishna is pleased with us. Dukhi Krishna Das said, “Bring me to your daughter in law, I wouldl like to deliver it to her myself.” Seeing the purity of his devotion, she brought Dukhi Krishna Das in Seva Kunj and dipped him in Lalita kund. 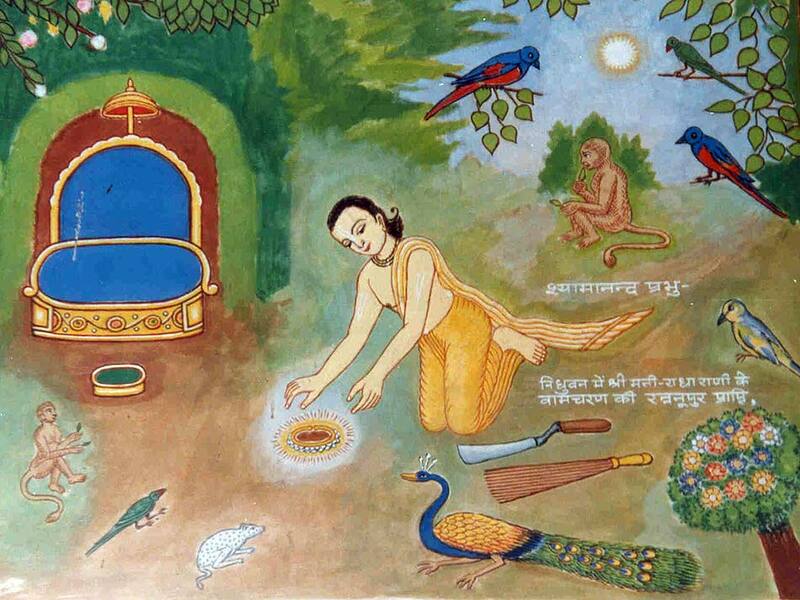 He came out of the kund in his original spiritual form of a gopi named Kanaka Manjiri. Then Lalita Sakhi brought Kanak Manjiri before Srimati Radharani. Radharani took the jewel and lovingly pressed it very firmly against his forehead and created a special tilak. Srimati Radharani said, “Because you have pleased me so much by your devotion, I want to give you that which is very dear to my heart.” Then from Srimati Radharani’s heart manifested a deity of Krishna named Shyamasundar. Lalita Sakhi said, “Because you have given so much happiness to Srimati Radharani, Shyama, Your new name would be Shyamananda but you must not tell anyone about what happened here.” When he came back to the association of devotees, they were wondering about his new tilak and name. But he could not tell them anything. 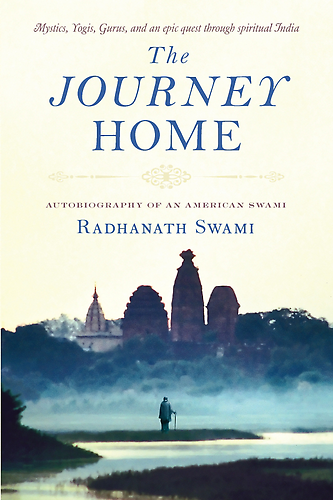 Srimati Radharani revealed the truth to Jiva Goswami but he could not tell it to anyone either. Gradually the news came to Hridayachaitanya and he was very much worried. He took many great souls and associates of Lord Nityananda and brought them to Vrindavan. When he inquired about what had happened, neither Jiva Goswami nor Shyamananda could tell him. Hridayachaitanya was very much concerned “You are making aparadha. This is not right.” He said “If this is really meant to be the tilak for you, then it will not come off even when I rub it off.” Hridayachaitanya started rubbing the tilak from his forehead and also the name Shyamananda which was written on his chest. But the more he rubbed, the more it shone and eventually Lord Caitanya personally appeared to Hridayachaitanya and told him everything. In this way everything was resolved in the most historical and wonderful way. In Radha Shyamasundar temple, the small deity on the right side of the large deity is the deity that was manifested by Srimati Radharani. The Maharaj of Bharatpur offered the self-manifested deity of Srimati Radharani to stand beside Shyamsundar.